If you are seeking ways to correct your nearsightedness (myopia), farsightedness (hyperopia), astigmatism (irregularly shaped cornea) or just have a desire to decrease or eliminate dependence on glasses or contacts, we can help. Our practice specializes in providing the most advanced refractive surgical options including some of the best Advanced Surface Treatment (AST) and LASIK eye surgery Michigan has to offer. Frequently considered to be one of the best LASIK surgeons in Michigan, Detroit based, Dr. Jay Novetsky carries years of experience with him in performing refractive surgery in the Detroit metropolitan area. Dr. Novestky has safely and successfully performed thousands of procedures increasing the quality of life for each patient. 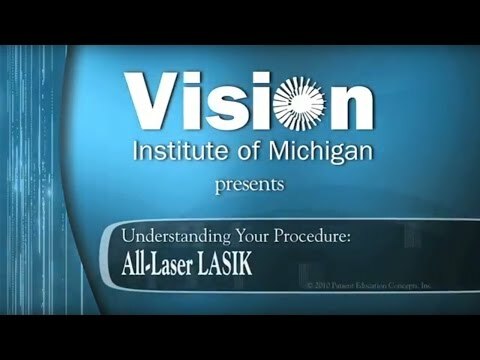 All laser vision correction procedures are performed at the Laser Institute of Michigan in Fraser. All pre and post-operative care is offered at any Vision Institute of Michigan location. LASIK, an acronym that stands for laser-assisted in-situ keratomileusis, is one of the most popular forms of vision correction surgery. The laser is used to reshape the cornea to correct near-sightedness, far-sightedness or astigmatism. It can eliminate the need for other vision correction, such as glasses or contact lenses. The procedure is done in two stages. First, the doctor uses a specialized laser to create a thin flap using in the cornea and fold it back. Using quick pulses of light, the laser removes corneal tissue from the underside of the corneal flap and then the doctor folds the flap back into place. Each eye takes less than a minute to complete and patients can go home afterward, although a designated driver is required. Post-surgery patients should take a few days off and reduce their activities. Follow-up appointments 24 hours afterward, and for the next several weeks and months, help to ensure the healing process is going well. LASIK eye surgery has been the “gold standard” in vision correction for years, and has advanced to produce even better outcomes. This procedure has been proven safe and effective on almost anyone who needs vision correction, and wants to reduce or eliminate dependency on glasses or contacts. Men and women over 18 years old who also have nearsightedness, farsightedness, or astigmatism can correct vision with LASIK eye surgery Michigan. Women who are pregnant or nursing can experience changes in their prescription due to varying hormone levels, and should wait until after they stop breastfeeding to have LASIK eye surgery. Additionally, your eyes should be in generally healthy and free of infection or certain other eye conditions prior to undergoing LASIK surgery. LASIK surgery is FDA approved, and has been shown to be a safe method of correcting vision. Our eye surgeon uses a cool beam of laser light to perform your LASIK procedure, which is safe and painless. While there are complications that may occur with any surgery, complications with LASIK are rare. Can I Have LASIK Performed on Both of my Eyes at Once? Yes. LASIK Surgery is commonly performed on both eyes at the same time. No. Your surgeon will place anesthetic eye drops into your eyes to numb the area before your procedure, allowing you to be completely comfortable. During the procedure, you may feel a bit of pressure around the eye as the laser is used to correct your vision. Most patients have stated they have only mild discomfort a day or two following LASIK. We can prescribe pain medication if needed. LASIK is a very quick procedure, completed in just one minute per eye. The entire procedure should be complete in about 15 minutes. You should not drive for 24 hours following your LASIK procedure. Your vision must be clear enough to drive, which may require a day or two. Most patients who undergo LASIK return to work the next day. While it is important that you rest and allow your body to recover the day of your surgery, this surgery involves a rapid recovery. Typically, patients return to all normal activities within a day or two. Your vision will continue to improve over the course of the next several months. You should avoid some activities such as swimming or sports for several weeks following your procedure. Occasionally patients will experience dry eye immediately following their LASIK procedure, which can be treated with moisturizing eye drops. This usually reduces and disappears over time. Others have reported seeing “halos” around lights at night. This side effect is usually temporary and should subside with time. In less than one percent of patients, vision worsens following LASIK surgery. It is important that you wear proper sun protection on your eyes following your LASIK procedure, as your eyes will be more sensitive to the sun’s rays. Will I Still Need to Wear Glasses After I’ve Had LASIK? While you should be able to go through your daily activities without having to wear corrective lenses of any kind, some people do still need to wear them at night for a short period of time. If you experience sensitivity to light following your procedure, photochromatic lenses will allow you to be comfortable outdoors and will protect your eyes from dust and debris. You can, however, you may find that once your cataract surgery has been complete that you no longer need LASIK. Modern cataract surgery allows your surgeon to simultaneously correct nearsightedness, farsightedness, and astigmatism through use of a specialized laser. How Long Will the Results of LASIK Last? The effects of LASIK surgery are long-lasting. As with all things, you vision may deteriorate as you age but many patients find that they do not need to wear any type of corrective lenses once their LASIK surgery is complete. In the past, the incision which creates the corneal flap for LASIK surgery was performed by the hand of a surgeon. With newer technology, the incision for the flap is now made with a laser known as a laser keratome. During the procedure, you will be given anesthetic eye drops to make the procedure painless. Once prepared, a small incision is made to create a flap on the cornea. The flap is delicately pulled back, but not removed. Then, a precise laser reshapes the cornea. Modifying the shape or curvature of the cornea alters how light enters the eye and is focused on the retina, dramatically improving vision. The goal is to flatten the curvature of the cornea for those with nearsightedness, increase the curvature for those with farsightedness, and smooth any imperfections for those with astigmatism. Once completed, the eye structure heals naturally and quickly, and no stitches are required. Recovery after LASIK is normally very fast, and your results appear almost immediately. You will likely notice your improved vision within hours. You will need to be driven home by a friend or family member. It is advised that you just rest for the rest of the day after the procedure. You will be given protective glasses to shield your eyes. Avoid rubbing your eyes or any other accidental bumps while the cornea is healing. Prescription eyedrops will keep your eyes lubricated and clean to promote rapid healing. Your eyesight typically continues to improve over the next three to six months following your procedure. The biggest benefit of LASIK eye surgery is the ability to reduce or even eliminate your dependency on glasses or contacts. No more worries about putting in and taking out your contacts, and gone are the days of keeping a pair of glasses in the car, next to your bed, and at work. After LASIK eye surgery, you’ll feel a newfound freedom and the joy of clear, sharp vision. Patient satisfaction is extremely high with LASIK eye surgery. The minimal, virtually painless recovery time make LASIK a safe and effective way to drastically improve vision. The Vision Institute of Michigan has a team of ophthalmologists and doctors with specific areas of practice that are here to serve you. We have long-standing relationships with our team of medical professionals, each of whom is happy to serve the Detroit area. One of our many doctors has been part of our team for over 30 years. Our unparalleled experience and commitment to patient well-being sets us apart. If you are fed up with wearing glasses or contacts, explore your treatment options to see if you can benefit from LASIK corrective eye surgery. AST is an acronym for Advanced Surface Treatment. This is an excellent technique for treating nearsightedness, farsightedeness, and astigmatism in individuals that are not optimal for the LASIK procedure. Reasons for choosing AST over LASIK include eliminating certain types of complications, thin corneas and loose skin of the cornea. Before the development of LASIK, laser vision correction was first performed on the surface of the eye and was called photorefractive keratectomy or PRK. PRK has been shown to have identical long term visual results as LASIK, but had the disadvantage of slower visual recovery, sometimes as long as 6 weeks, and more discomfort. Traditional PRK also required the use of medicated eye drops for usually a period of 3 or more months. Advanced surface treatment is different from PRK in that there is faster visual recovery and improved comfort. This is achieved by using new methods that were not available when PRK was first developed. In AST, anesthetic drops are applied to the eye for comfort. The epithelium, which is the surface layer of the cornea, is then gently removed by a soft automated brush. Laser treatment is then performed to reshape the eye to the appropriate prescription. The result of these new methods is improved comfort and faster healing after surface laser treatment. Usually patients see well within several days after AST treatment and only use medicated drops for the first several weeks after the procedure. Today, AST is an excellent alternative for patients that are not ideal for the usual Michigan LASIK procedure we offer. Contacts can be uncomfortable and are often a hassle to clean and care for. They can cause infections and end up costing you a lot of time and money over your lifetime, and even more with doctor visits and prescriptions. The cost of contacts over a lifetime versus the price of the Lasik procedure is quite surprising. Calculate how much you spend yearly and based on your age apply that for the next 10-50 years and you'll realize how much you'll save by coming to our laser eye surgery Michigan offices. User our convenient and easy payment calculator to stay within your budget!